A Very Gaga Thanksgiving was one of those specials that shouldn’t have worked, and didn’t if we’re really being honest: equal parts concert, memoir, and holiday special, it veered wildly between the singer’s extravagant stage show and the intimacy of a family holiday. It lacked any evidence of an editor in the conceptual stage, designed for Gaga to promote her music, perform with famous friends, reflect on her career and journey, and write a new verse to “White Christmas” because that song was just too short. What I admired about it, though, was how unwilling it was to adhere to any of its various parts. It felt exactly like what one would imagine if they heard that Lady Gaga had a holiday special airing on Thanksgiving, a decision that makes it exactly as idiosyncratic as it needed to be to turn into something I’d gladly revisit on Spotify in the two years since. Lady Gaga & The Muppets’ Holiday Spectacular follows more or less the same format as her previous special, but the very thing that made me more excited for it also made it far less successful. Taken as a Lady Gaga special, the 90 minutes offer a few engaging performances of songs from ARTPOP, an album that’s underperforming and devoid of a mainstream pop hit, but also an album that fits well with her theatrical live performance style. Paired with stars like Sir Elton John and RuPaul, the songs from ARTPOP—for lack of a better pun—pop, and I remain convinced that Gaga has the charisma to pull off a variety show of this style (as evidenced by her recent strong stint hosting Saturday Night Live). The problem is that this wasn’t a Lady Gaga variety special. This was billed as—it’s right in the title!—a holiday special featuring Lady Gaga and The Muppets, and it even opened with Lady Gaga telling us about her love of the Muppets as images from The Muppet Christmas Carol and A Muppet Family Christmas—my personal favorite—appeared onscreen. It was a direct callback to the nostalgia we have for both the holiday specials of yore and the Muppets in general, and set the stage for a trip down memory lane with characters we care about. And although there were elements of the special that merged the Muppets and Lady Gaga, and other elements of the special that brought together the Muppets and the holiday season, there was not a single segment outside of that opening voiceover that brought together the Muppets, Lady Gaga, and the holiday season. As a fan of the Muppets, Lady Gaga & The Muppets’ Holiday Spectacular was—for lack of a better play on words—anything but spectacular. Early in the special, there were hints at classic Muppet Show narratives, with a love triangle between Piggy, Kermit, and Gaga, and a sequence in Gaga’s dressing room where the Muppets work to brainstorm ideas for the closing number. But the love triangle would be ignored for over an hour after its introduction, and any more substantial backstage narratives featuring Gaga or guests like Kristen Bell and Joseph Gordon-Levitt never materialized. Additional Muppet material emerged through brief video shorts akin to content on the franchise’s Muppets Studio YouTube account, teases of an actual Muppet holiday special that were immediately tossed aside in favor of another performance from ARTPOP. There’s a collection of fun bits and clever jokes scattered within that material, and the blooper reel at the end of the special featuring the Muppets was a lot of fun, but it was difficult to shake the feeling that the “& The Muppets” part of the special’s title was not the priority in the special as a whole. It didn’t help that the only two full performances that had anything to do with the holidays never brought the two together. Lady Gaga’s gender-swapped “Baby, It’s Cold Outside” with Gordon-Levitt was slight but charming, and Miss Piggy’s “Santa Baby” did a nice job of merging the holiday standard with her distinctive charms as a performer. However, none of Lady Gaga’s other performances had anything to do with Christmas, or Thanksgiving, or Hanukkah, or Thanksgivukkah, or any other holiday you could imagine. They also only tangentially involved the Muppets, relegated to backing bands and backup singers/dancers in the majority of performances. They felt like an afterthought, as though the idea of working the Muppets into the production had come at the eleventh hour. 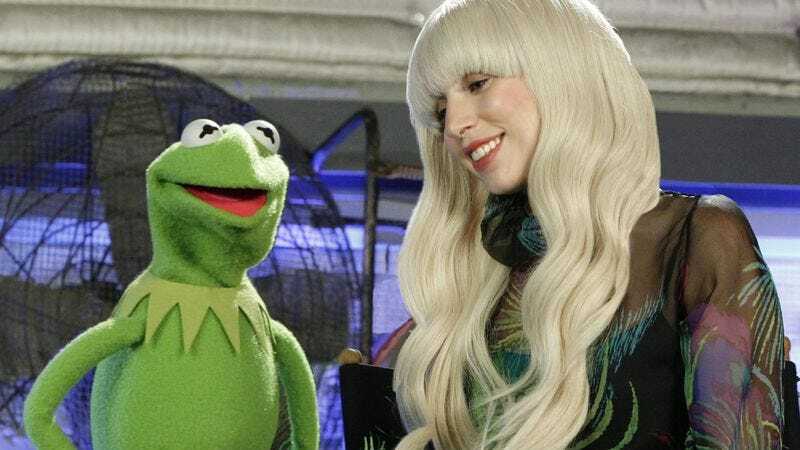 Lady Gaga’s duet on “Gypsy” with Kermit was earnest and well performed, but it didn’t feel like the product of a Lady Gaga and The Muppets special; it felt like Kermit making a cameo in a Lady Gaga special, a problem given the shared billing in the title. As part of the promotion for the special, Statler and Waldorf took over the official Muppets Studio Twitter account, and mirrored the running commentary the two offered from the box seats after each Gaga performance within the special itself. “There’s nothing like a classic holiday song,” Statler said after one Gaga performance; “And that was nothing like a classic holiday song,” Waldorf replied. It was meant to be a clever joke, but it was also exactly what I was thinking at a point where no one had sung a single holiday song in the special to that point. On Twitter, people were retweeting “Statler and Waldorf’s” tweets like this one not because they were funny jokes, but because they were actual sentiments that Muppet fans were feeling watching a special that only sporadically delivered on its title’s promise. I enjoy Gaga enough as a performer that I would happily watch Gaga dueting with RuPaul on “Fashion,” but that wasn’t the way the special was positioned, and I felt too robbed of the opportunity to see RuPaul and Miss Piggy lipsynch for their lives. We have come to accept things associated with Lady Gaga to play against the most logical approach, eschewing tradition or structure in favor of chaos and experimentation. By comparison, the Muppets are something sacred, something that we are conditioned to protect, particularly in light of years of neglect before their recent return to the pop culture spotlight. Nothing in Lady Gaga & The Muppets’ Holiday Spectacular destroys the sanctity of the Muppets, and the parts of the special that were focused on their contribution ranged from amiable to delightful in the way that modern Muppets content tends to. However, the potential for a Muppets holiday special was never given room to materialize amidst a Lady Gaga concert special designed to sell her new album. The choice to combine the two may have reached out to a broader audience, but the incongruence of the special’s various parts—and the production’s inability to balance those parts on any level within the production itself—was bound to frustrate a sizable portion of that audience and send few viewers to bed feeling as though they had another holiday special to add to the canon. It’s more likely it sent them looking for the remote, and then the nearest Muppets holiday special they own on DVD, and then a far more satisfying way to usher in the holidays with Kermit, Piggy, and the whole gang. Joseph Gordon-Levitt and Kristen Bell, as one would expect, are exactly the type of people who can sell you on interacting with Muppets. Bell’s dance lessons with Bobo were one of the sharpest comic interludes (“Is that soap you’re wearing? ), while Gordon-Levitt’s conversation about the Holidays with Kermit was reliably endearing. Last year she writes a new verse to “White Christmas,” and now Sir Elton changes it to “Gaga and the Jets?” She’s gone too far. Fun fact: I now associated “Bennie and the Jets” exclusively with 27 Dresses, because every time I turn to that movie on cable I somehow tune in right before that sequence. Thanks, cable! I’m always interested to see how they integrate Walter into the Muppets following his introduction, and I thought he got a nice laugh with “I didn’t know we were going for the obvious” following Gonzo’s—for lack of a better pun yet again—gonzo, Gaga-esque plan for the final number. I like him as a straight man. Those watching with me felt there was something super creepy about Swedish Chef’s “real hands” puppeteering when those real hands are really close to the camera and in high-definition. Also, someone noticed the Swedish Chef got married recently, given he was wearing a wedding ring? That’s a story I want to see.